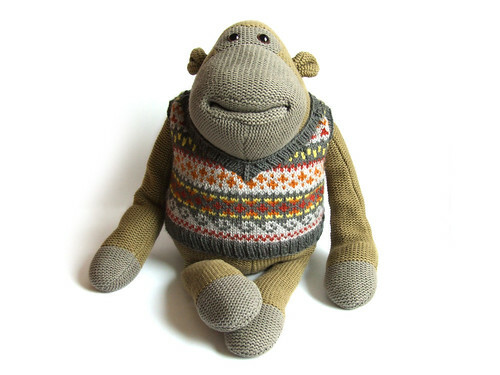 Many readers of my old blog will no doubt remember co-star, wonderful model and sometimes knitter, Giantmonk, my partner in craft and giver of all the cuddles in the world, absorber of sadness. When I moved last year he was one of the things that I could not bring with me, and easily the one thing that I missed the most. I am not ashamed to say that I got a tad upset every time someone inevitably asked ‘but you have Giantmonk, right?’. No, I did not and I missed him terribly. Mr Awesome would listen and understand this, and didn’t mock me for it. He asked me a few times if I would get another Giantmonk. No, I couldn’t because it wouldn’t be the same if I bought myself another. A good amount of time had passed and I missed my Giantmonkey cuddles so much, when one day last week I walked into the bedroom and saw someone sitting on the bed. I heard that you were missing my friend and cousin Giantmonk very much, so I wondered if you wanted me to come and stay with you for a while. We used to play together when we were growing up, so I’m very good at giving hugs if you ever feel upset. Of course, if I remind you of the other Giantmonk too much then you don’t have to keep me around; but I’m here if you need me. One of my favourite things about the letter is that he uses a semi-colon. I have no idea what they do. 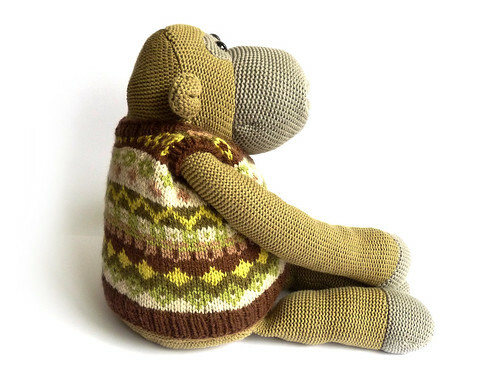 So, I had a look through a few part-balls of Stylecraft special DK I had and we worked out a nice colour palette of greens and browns, and I set about making Giantmonk a Tank-oo Top of his very own. 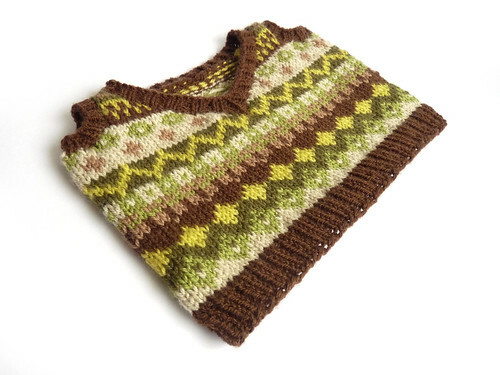 Exactly as with Cousin Giantmonk’s Tank-oo Top I didn’t pre-plan the colourwork but just made it up as I went along. Keeping to a six-stitch count motif made this really simple, making elements of five, three and one stitches line up with a spacer stitch as I went along. The tank top uses the same 120 stitches around as the past grey yellow and red tank top, and fits just as perfectly. The resulting tank top looks quite different due to the choice of colours and motifs, and I absolutely love it. I absolutely adore knitting stranded colourwork designs, and I’m a lucky knitter that doesn’t seem to have any tension issues in this regard (which is a good thing as I was working with acrylic and so my knitting sins would not be all that easy to sort out with that branch of the dark arts known as ‘blocking’). Hopefully Giantmonk will enjoy being even more cuddly in his super warm tank top and will get to show it off when he pops up on this blog once in a while. I wonder if he’s any good at modelling? Giantmonk, a classic Grattan’s catalogue pose, if you will? What about shielding your eyes to the sun as you look to shore on the deck of your yacht? He looks very handsome. He needs a flat cap, you know. So cute! I love the sweater. I pronounce this the cutest thing on the internet today! I could die of the cute. What sweet colors in his awesome tank top! Aww, I wondered the fate of giant monk. 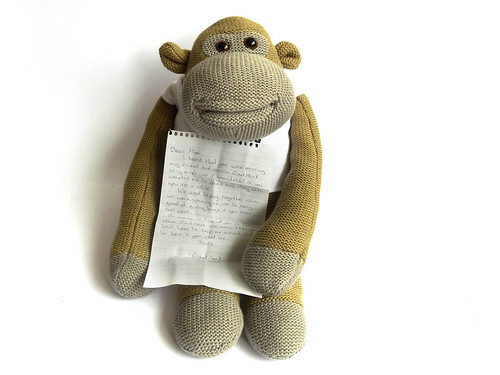 I loved reading his and monkey’s adventures in your “world of monkey” blog. Tickled that his cousin is keeping good company with you. Also, his new tank is quite smart – nice job! What a wonderful letter and a story full of love. How fitting to have a vest to reflect all that is special; and he is so handsome. I stumbled on your site this morning, and am quite glad I did. Oh my goodness these are too darn cute! 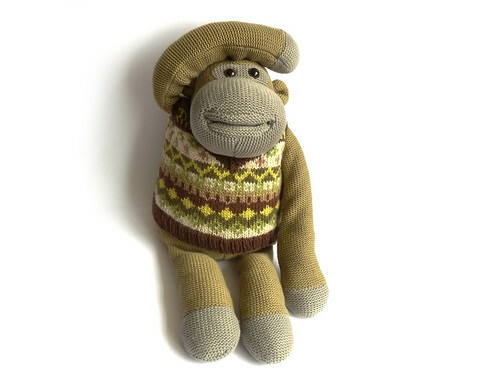 Love those monkies and their colorwork vest! The vest is too precious =D And I welled up a bit at the story, Mimi. Oh Mimi, you are made of win and awesome. 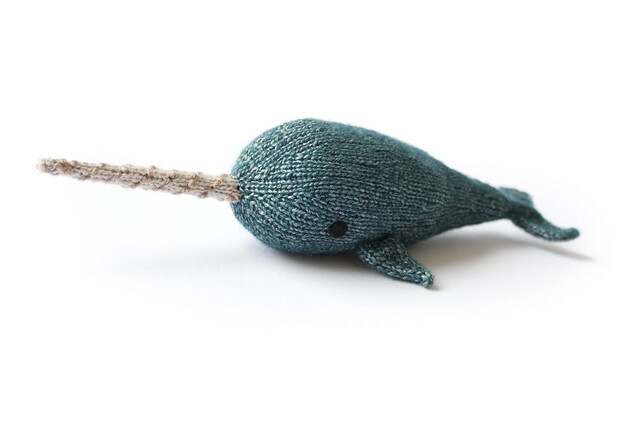 OMG – that is is so darned cute! I think I’m in lurve! I am so glad you let him stay and made him this wonderful sweater. Mr Awesome is well named. I love the sweater vest! 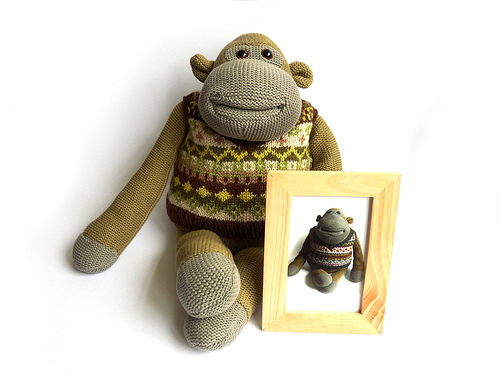 Monkey looks quite dapper. Yay for Giantmonk’s cousin coming to be with you 🙂 I love the little tank top, such a great colour palette! So lovely, I cried. And the tank top. just gorgeous.